CAREFUL! This Melon Has Spines and THEY HURT! | Keep It Up, David! 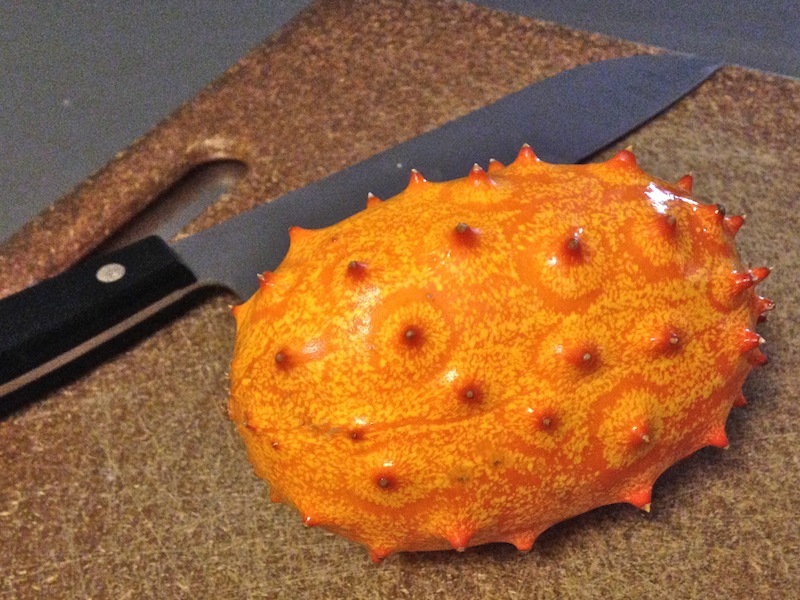 The sign at the store called it a Horned Melon, although it has other names, too, depending on where you are in the world, incuding Horn Melon, Jelly Melon, Kiwano, Horned African Melon, Cherie, Melano, Hedged Gourd, and Horned African Cucumber. So beautiful! 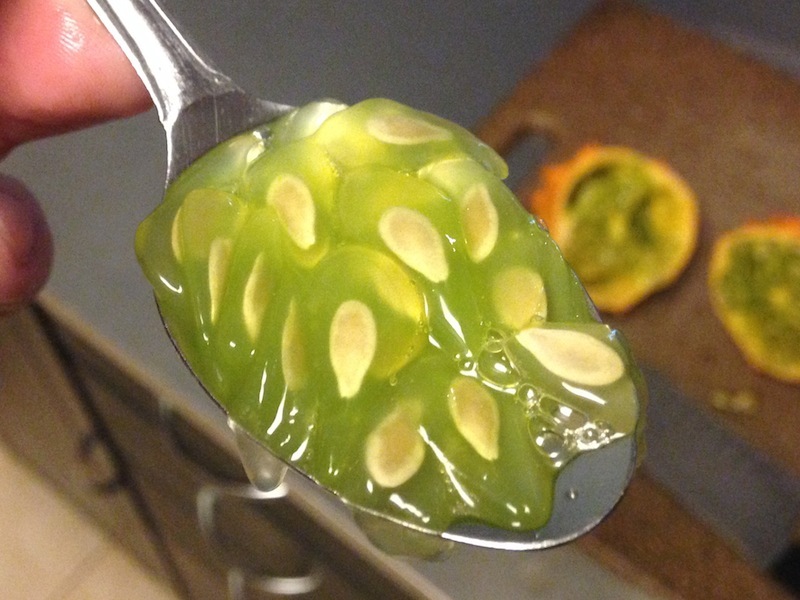 I put the melon down and did a little research – I didn’t want to eat the inedible parts or toss the good parts. 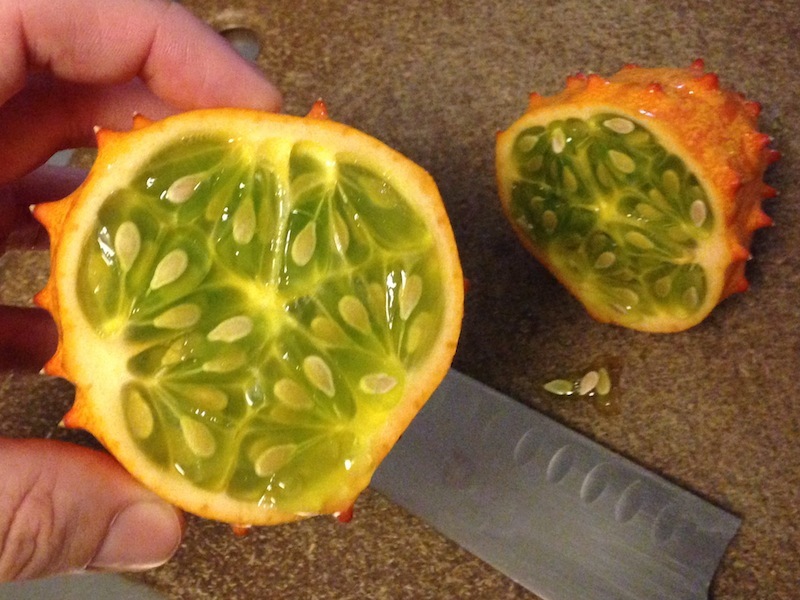 Turns out, the entire inside is edible. There are tons of little seeds, like the ones in cucumbers (which it is related to, as are all melons), and each one is in a little flesh sack, which is also edible – and where the flavor is. Then I spread some out on a plate. It’s kinda cool how they don’t pop or burst, kinda like the inside of a pomegranate. The seeds have no flavor at all (at least none that I could taste), but the fleshy green sacks taste like a sweeter version of a cucumber. Like a cucumber mixed with a little kiwi, or pear. 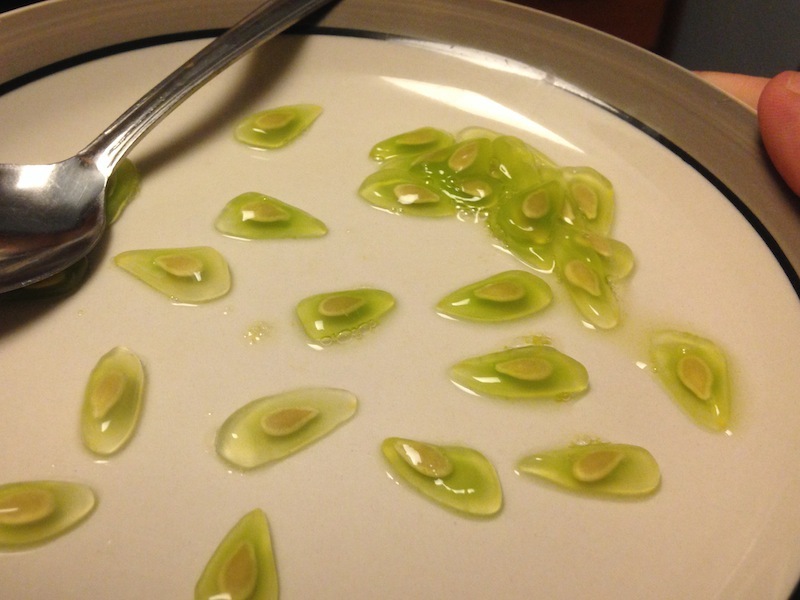 They’re also super watery and thin – they slide right down, like the bubbles in boba tea. I ended up digging out all the seed sacks with my spoon. There were a few tougher membranes that I had to work around, but nothing too difficult. 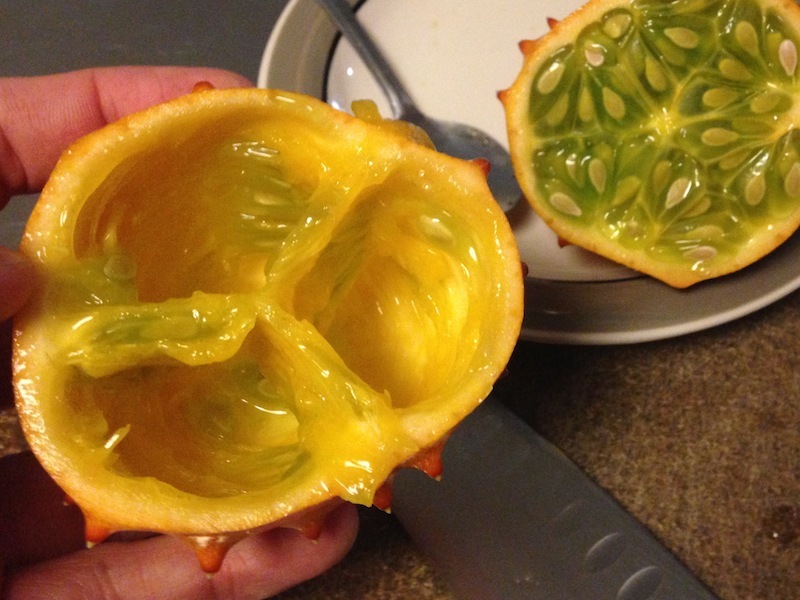 Horned Melon, I just learned, is about 80% water, high in vitamin C, and has also has some iron and potassium. It’s native to southern Africa, but most of the farming for these melons happens in New Zealand. (I’m not sure where mine was from.) In New Zealand, they’re both a cultivated crop and an invasive, unwanted weed. 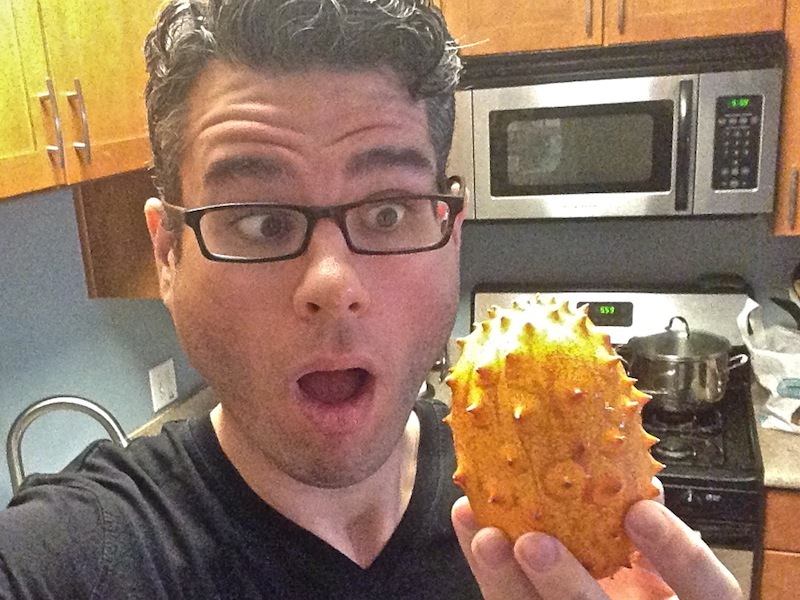 I’m not quite sure what I’d do with a Horned Melon if I were to cook with it. The flavor, while pleasant enough, might not be bold enough to mix with other things, and I’m not a fan of pomegranate seeds in fruit salad, so I don’t even think I’d put Horned Melon seeds in a fruit salad either. But it was fun to eat by itself, and this was definitely a successful outing in my long-standing mission to buy and try new-to-me produce items (I have dozens more reports archived here). Trying new fruits and veggies is a great way to expand your palette… especially because they’re all going to be good for you! I found another exciting item in the produce section at the same time that I found this one… but I’ve saving that post for next week! This entry was posted on Friday, October 2nd, 2015 at 11:08 am and is filed under Uncategorized. You can follow any responses to this entry through the RSS 2.0 feed. You can leave a response, or trackback from your own site.